These pictures are among fifteen belonging to the local photographer Ibrahim Jacas and they will remain three months in a room from the Provincial Registry of Cultural Funds, next to the National Hymn Plaza. 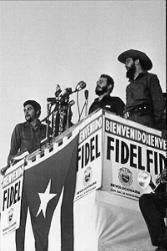 The collection includes the first picture of Commander in Chief Fidel Castro in Bayamo, on January 2nd 1959, the day of the definitive liberation of the city and one of Camilo Cienfuegos with a child on his shoulder, also on those memorable hours in this city. In other images, the internationalist hero Ernesto Che Guevara is writing his campaign diary in the Sierra Maestra, and a family from Bayamo is clandestinely listening to Radio Rebelde, the broadcasting company created by the rebels in those mountains. With an extraordinary testimonial and artistic value, the pictures reflect also other moving images, such as the first popular trial which took place in the Monument City, and the exhumation of the remains of people murdered by troops of the pro-Yankee tyranny of Fulgencio Batista. In general, ten pictures leave a constancy of singular events which took place during the years 1958 and 1959, while five of them represent places with a high historical importance, taken years later after the triumph of the revolution. Jacas is the author of many pictures that document the glorious deeds of the Cuban people for more than fifty years, including those published in the CMQ Television Channel (1958), the Bohemia magazine (1960) and the El Mundo newspaper (1963), of which he was a correspondent.